You might have noticed that the landscape of Minneapolis and St. Paul is generally flat. But if you love rock climbing, you'll be happy to discover this area has three rock climbing crags within an hour's drive of the Twin Cities, several climbing walls in Minneapolis and St. Paul for practice and winter climbing, and a vibrant local climbing scene. There are three climbing spots within an hour's drive of Minneapolis or St. Paul: Interstate State Park, Taylors Falls, MN/St. Croix Falls, WI. On the Minnesota-Wisconsin border, straddling the St. Croix River, are basalt cliffs. The climbing ranges from easy climbs for beginners and children, through a variety of routes that get as easy, or just about as difficult as you like are possible. Climbs range from 5.4 up to 5.13 and have places for anchors, and easy access to the top of the cliff which makes it perfect for top-roping. Trad lead climbing is also possible on most of the routes here, solid protection. The unique geology of the St.
Croix valley created many interesting rock formations and there's plenty of bouldering opportunities. All climbers at Interstate State Park need a climbing permit, which can be obtained for free at the park office. A parking permit is also required to park in the Minnesota side lot, and a Wisconsin parking permit is required to park on the Wisconsin side. Pros: The rock is mostly great, solid holds, solid places for anchors and protection, nice variety of climbs, and a great view from the top. Cons: Mostly great means that there are still places with loose rocks, and size of the loose stuff is usually somewhere between "large" and "large boulder." Wildlife enjoy the rocks too - wasps love Taylors Falls as much as the climbers do. And the other park users, while mostly curious and harmless, can't be relied on to not get in harms' way, or play with your anchors. A limestone bluff high above the town of Red Wing on the Mississippi River, known as Barn Bluff has almost a good a view from the top as you get at Taylors Falls. Setting top rope anchors at Red Wing is either impossible or prohibited due to ecological damage that was done to the top of the cliff. So most routes are bolted for sport leading and have fixed anchors at the top of the routes for lowering and top-roping. There are around 100 sport routes, ranging from 5.6 to 5.14. Trad lead climbing is possible here on a few cracks, but this is one place you'll really want to know what you are doing - the rock is nowhere near as solid as it is at Taylors Falls. Use your own carabiners on the anchors if you plan to top rope here - it saves wear on the fixed gear at the top of the routes. Pros: Minimal gear requirements as almost every established route has been bolted for sport leading. A rope, a set of quick draws and a buddy is all you need for a day of climbing. It's possible to climb here in the winter on a mild sunny day when the sun warms the rock on the south-facing side. Cons: Not a place for beginner sport leaders. Even though there are several easy and moderate routes, the rock on them is often polished and they can be run out since they were bolted by six-foot-tall, 5.14-climbing first ascensionists. So routes in the 5.6-5.9 range often feel harder than their grades. Harder climbs, those above 5.10, feel more like their grades imply. Bringing a pole to stick-clip the first bolt (or even two bolts) isn't a bad idea. The rock isn't as solid as Taylor's Falls, and chunks of it do come off. You'll also need to wear a helmet for protection from regular climbing hazards, and also from rocks that local kids seem to enjoy throwing from the top of the bluff. This area is known as one of the most intimidating places to climb in the Midwest, Willow River's falls carved out an incredible overhanging gorge, which has several bolted sport routes on it. There's one 5.9, and everything else is at least a 5.11 through ungraded projects. The routes are all endurance climbs involving big moves to big holds. Willow River, if you are strong enough to climb here, offers thrilling, addicting climbing. Climbing hours are restricted - climbing is prohibited on Saturday and afternoon on Friday and Sunday. Pros: Unique climbing location for the Midwest, and incredibly fun climbing if you are good enough. 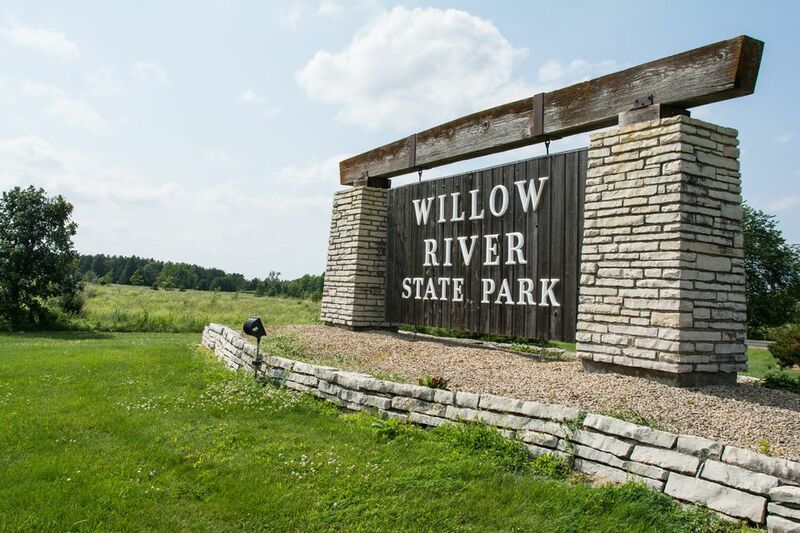 The rest of Willow River State Park is very pretty and fun to explore. Cons: Blowing the crux on the only 'easy' climb will probably result in a broken ankle on a ledge right below it. (All the other climbs generally have safe falls once above the first bolt or two.) The river makes it almost impossible for climber and belayer to hear each other without yelling so pay attention to your climber. Routes at Taylors Falls, Red Wing, and Willow River are described in the Minnesota climber's bible, Rock Climbing in Minnesota and Wisconsin, by Mike Farris, available at outdoor stores and bookstores in the Twin Cities. And as the title suggests, there is plenty of beta for several other climbing crags around the region. Vertical Endeavors climbing gym in St. Paul has lots and lots of walls with over a hundred routes, most for top roping, but plenty of lead climbing too, and auto-belay routes for solo climbing. And there are two bouldering caves too. It's almost good enough to stay indoors for (almost), and certainly keeps climbers very happy and in shape over the winter. Midwest Mountaineering has a free bouldering cave in their basement. Sign up at the register in the climbing department and then get climbing. REI in Bloomington has the Vertical Endeavors-designed Pinnacle. It's set up with routes for children, plenty of beginner and intermediate routes, and a couple of harder ones mixed in. It's the tallest climbing wall in the Twin Cities. REI members get one free climb of the Pinnacle per day when it's available for climbing. Life Time Fitness gyms in the Twin Cities have rock climbing walls for their members including those in Chanhassen, Eagan, Lakeville, and Plymouth. Check their website for more locations. University of Minnesota Climbing Facilities have a climbing wall with five top ropes and a variety of routes, and the University Recreation Center on the Minneapolis campus has a bouldering wall. Membership of the Department of Recreational Sports, available to anyone, is required to climb at the St. Paul wall. Midwest Mountaineering is the local expert store. In Minneapolis' Cedar-Riverside neighborhood, the people who work in the climbing department are all climbers who love climbing and know what they are talking about. Sign up for their email list and receive coupons, birthday discounts and reminders for store events, like the twice-yearly Outdoor Adventure Expo and Sale, and the bargain hunter's paradise employee garage sales. Vertical Endeavors climbing gym in St. Paul has a pro shop with a decent selection, and every month one type of gear goes on sale - one-month shoes are 20% off, the next month ropes are reduced. Sign up for their email lists for notifications of sales. REI, with locations in Maple Grove, Roseville, and the flagship Bloomington store, carry a small selection of climbing gear.